On Tone 13 we Ascend to a Higher Consciousness of Unconditional Love. Through the Wisdom of Experience we learned the challenges and opportunities to fulfill our Divine Meaning and Purpose. 13 is the number of Creation as the 7 days and 6 nights, and the symbol of a Covenant between the Above and the Below. In a Choice to Offer our Self to Serve the Intentions of Divine Will, the Creator promised that our Prayers for Help would be answered. Our Unlimited Power to Create the Experience of Love would be guaranteed by a Divine Intervention. Wind/IK is the Breath of Life and the Breath of Spirit. The Cherokee Day Sign the Whirlwind represents the double-helix of smoke that rises on the Wind to carry our Prayers to the Creator. On 13 Wind/IK we Ascend with a Higher Consciousness that the Creator hears and responds to every prayer that calls for a Manifestation of Love. Our Human prayers for Love reflect the Divinity we share with the Creator, who Spoke the Intention of Love as Meaning and Purpose for a world Below. Our prayers of Love create the Harmony of Sound between the Above and Below that vibrate as the One Song of the Universe (uni-verse). Human’s Highest Aspiration is to serve as the Creator’s Spoken Words of Love on Earth. Through Human, the Song of Unconditional Love could be heard and recognized by the world Below, as a gift that is beyond our Human capability to Give. In an Intention to share Love that doesn’t ask anything in return, we bear witness to the Divine Nature of Human, the evidence that we are guided by something greater than our Human instincts. Tone 12 is the Day of Understanding. Tone 12 guides an Intention of drawing all the disassociated parts of our experience together into a new and functioning Whole. We can see something new by looking back to the elements of our experience to see them all together. Crocodile/IMIX is the Dawn of a new Awakening. The Dog/OC trecena has offered us an experience of the realities of carrying out a Meaning and Purpose that fulfills the service of Unconditional Love. As we faced the everyday challenges, we also learned ways to carry it out. We also learned that through our Communion with the Creator, we can always turn to a Higher Source for Guidance, Wisdom, and an Unlimited Supply of Unconditional Love. Crocodile/IMIX is the Primordial Mother who was present to witness our first moments of Consciousness. IMIX is the Divine Feminine, the Mother of Compassionate Love who saw us in the purity of our Innocence, and Dreamed for us the Love we might Know as our Life Experience. IMIX is the Alpha, the One who first identified us as Divine, holding the Power to manifest every Dream of Love we could imagine. 12 Crocodile/IMIX begins the uinal of Manifestation. Like the Tone 10, we will manifest what we claim. As we complete the trecena of Dog/OC, we are blooming in the harvest cycle of transformation. The 10th uinal can present circumstances we’ve faced before, allowing us to see the transformation in our perspective and response. The 10th uinal calls for an assessment of where we are now, and what that means to our future. Tone 11 offers Resolution to a new understanding. Tone 11 is the day the shaman climbs to the highest altar to receive Divine Inspiration. Dog/OC is seating the Wisdom of Love from our own experience. By helping us see the Divine Purpose, Tone 11 generates the energy of dynamic actions that facilitate change, simplification, and improvement. Sun/AHAU is the Day Sign of Life, Light and Happiness – the Lord of the Calendar. The Intentions of Sun/AHAU are meant to be our guiding light for living. 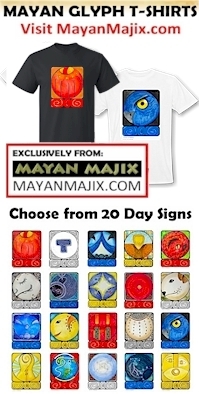 The Cherokee Day Sign, the Flower, symbolizes the face of the flowers that follow the Sun across the sky. Sun magnifies the Inspiration of Tone 11, as the Day Sign that shares the brightest Light. Our encounters with Sun/AHAU are known for returning a Revelation of Spirit. Sun shines its Light on what was hidden in the shadows or hidden in plain sight. Sun is the Supreme Creator and the Master of all Pursuits… our Hero. Sun gives us the Will to Live. Human is among the living things that depend on Light for their survival. We depend on the Light of a new Spring for our ongoing nourishment. As the Creator who made us, AHAU knows our full capabilities. Sun encourages our courage, bravery, and self-confidence to follow our Dream of Higher Consciousness. COMPLETING THE 9TH UINAL: 9 is the Number of Patience. Sun/AHAU brings Light to the big picture. Sharing the gift of retrospection, we’ve been guided to look at our past for the evidence of the transformation of our future. 9 is all about completing a new perspective of our Self and the world around us. Tone 10 holds the Intention of Manifestation. The focus of our Intention, our ideas, hopes or fears become physically present with the energy of Ten. 9 Flint/ETZNAB offered the Truth to Complete our Transformation with a perspective on the Bigger Picture. The 9th Tone of the 9th uinal elevated our perspective on the Dog/OC trecena’s Intention to embrace our Life Experience in the Service of Loving the Whole. We were guided to see beyond our own Dream of Unconditional Love to the Dream of the Whole. Storm/CAUAC offers the Unbridled Power of the Creator for the purpose of a Renewal and Regeneration. CAUAC represents the comfort of Home, the place we are naturally drawn to when we see a Storm on the horizon. A Storm can change the landscape of our life, requiring us to assess and prioritize a call to action. We’re called to Service in the place we are most needed. CAUAC is an unbridled display of the Forces of Nature and the Creator’s Power and Light. Lightning displays the connection between the Above and the Below, and the magnetic attraction between Human and the Creator. The Creator’s Power can reach us wherever we are. The Cherokee Day Sign the Redbird is a Sign of this Lightning Energy in the sky that draws us into Unity with a Power Above. CAUAC offers Renewal and Regeneration through a gift of “lightning in the blood,” our Sixth Sense of Knowing. The energy of Manifestation holds a great Blessing and a great Responsibility. We will manifest what we can claim as our Truth. Tone 9 holds the Peak Energy of Transformation. Through an Intention of Patience, we are guided by a gift of retrospection to see the bigger picture. Tone 9 warns that there could be suffering to bear for a lack of patience in understanding. Completion is all-important to the number 9. 9 is the all-in-one that makes up the zero, the Omega. Flint/ETZNAB presents an unexpected Truth of something that has been hidden or covered up. Flint is said to present temptation to act out of character. Though, what is revealed is the hidden Truth. The Truth that will complete the Transformation of the Dog/OC trecena will elevate our perspective on Love. The Flint Knife was the sacred object used to cut to the heart. Flint cuts through an illusion that stands in the way of our experience of Unconditional Love. ETZNAB is also known as the Mirror, symbolizing the Obsidian Mirror that returns a perfect reflection of hidden truth. Tone 8 holds the Intention of the Justice of Harmony and Equity. 8 is the number of “pure spirit” and the Tone that begins the trecena’s phase of Transformation through Tone 8-13. The energy of an upward climb shifts to a descent. Through a Divine Intervention we are drawn forward by an Unseen Force of Spirit. 8 Earth/CABAN (8 No’j) is a Holy Day celebrated as the “Day of Awareness/Knowledge.” The Aztec refer to 8 Ollin (Earth) as the “Day of the Purified Heart”, signifying those moments when Humans hold the Consciousness to Perceive what they are becoming. In the last trecena Earth/CABAN inspired us to draw close to Mother Earth, and to see our Self as One in the Consciousness of a Creation of Love. CABAN brought the Inspiration to Move in an Intention of Love. The Dog/OC trecena is the cycle of application that follows to offer us the Wisdom of the Experience. Earth/CABAN returning in the 8th Tone reflects its zenith position of Illumination. Divine Inspiration and Human Intention are drawn together as the Sacred Exchange that begins a Transformation. 8 Earth/CABAN can help us clearly see our Destiny on Earth and our Divine Purpose for Being. Our Destiny is the Pilgrimage of Life on Earth, an Expedition of Love. CABAN reminds us that we are One with Mother Earth, the source of everything Human could ever Know. We are made of Earth and hold all the same Elements and Forces of Being. Just as Earth is capable to draw our Consciousness, so does Human hold the Force to draw the Justice of Harmony. Tone 7 is the Peak Energy of Balance. Tone 7 represents the Spiritual Principle of “As Above, So Below,” the Great Law of Creation that what we create in one realm of existence, will be balanced in all others. The Gift of Unconditional Love that we offer in Spirit, will be balanced in the realm of physicality. Wisdom/CIB represents the Old Ones, the Ascended Masters who walked this path before. CIB is the symbol of their Collective Wisdom that was preserved as our Sacred Inheritance. We can Honor them for the Higher Ground we were given at our own beginning. The glyph illustrates the Mind in its Highest State of Consciousness, emanating the Rays of Light of Love, Consciousness, and Forgiveness. Forgiveness is a gift of Love that only a Human can offer to another. In the Creator’s eyes, we are Loved Unconditionally and seen as Sacred as a Human Sacrifice made for Love. Human Forgiveness is Divine in that we saw the fault in another, and made the Choice to Love and Forgive. We might consider how hard it can be for Human to Forgive. CIB resides in the South, the direction of our Relationship with one another and with the Natural World. CIB holds the Highest Wisdom of the Human Experience and shares the way to Create Harmony and Right Relationship with the Whole. Tone 7 holds the Intention of Reflection. At the top of the pyramid are offered 360 view. We can reflect on the effort of our climb as the measure that will be balanced in the Above and the Below. The effort of a Human Intention will be Multiplied to Abundance by an equal effort made by a Divine Agency. PORTAL DAY: Element of Ether – The Peak Energy of Tone 7 is magnified by a Portal. Portals thin the veil to the dimension of Spirit and Magnify the experience of our Spiritual Gifts. On 7 Wisdom/CIB we are capable to Know and Acknowledge the Love passed down to us, and the Forgiveness for all the Love our Human eyes have been unable to see. The Light of the Old Ones is eternal to shine a way.